As most of you know by now, Rich and I have been extremely thrifty during this pregnancy, getting things at deeply discounted rates, as well as many for free. Yesterday, we visited two local ARC thrift stores and you will not believe how many good items we found for about twenty bucks total. The details of this amazing thrift store haul, along with their actual value are outlined below. This car seat canopy, blanket, & breastfeeding cover combo piece cost us all of a dollar and fifty cents. They generally go for $20-$25 on Amazon and sometimes more elsewhere. These soft counting blocks cost us 69 cents. I was unable to find the exact ones. However, they are new in the package. and those I'm finding are much more than what we paid. Therefore, it was definitely worth the pocket change we paid. This baby quilt appears to be handmade, but we're not sure. We can't find the exact one on Amazon. However, those similar in thickness usually go for anywhere from $70-$130, on average. We got it for about two bucks and it looks new or almost new. This shopping cart and high chair cover has interesting pictures and activities for baby. It's an older model but still in like new condition. The exact one is not available on Amazon, that I could tell. But, a comparable one is about 27 bucks. We got it for two dollars. The bigger doll pictured is a Baby Born Interactive Baby Annabelle Doll by Zapf Creations. They've now become collectible dolls. Therefore, the exact version we got for Aja is not available on Amazon. Every similar version we can find is listed at around $500, as of 5/29/2016. This is the same type of doll she got last time as well. So, now she has two of them. Just like last time, we got it for a dollar. The other doll pictured came in a big bag of assorted toys that was only two bucks total. We don't know the value of the small doll or what kind it is. Like other fashion, baby clothing changes like the wind. So, we can't find the exact pieces. However, this newborn outfit was a buck fifty. Brand new, Carter's sets like this usually go for about ten or fifteen bucks, easily - sometimes more. This is another cute baby comforter we got for a dollar fifty. I can't find any like it. But those comparable in thickness and size seem to run from $70 on up to $150. I don't really tend to use these carriers very often for my babies, as I prefer holding them naturally for health benefits. However, it's good to know I now have this option for those rare moments I need to be hands-free. We got this older model for about a dollar. Today's carriers range from about $15 to hundreds of dollars. Because this one is able to be in more than one position but isn't very fancy, a comparable one might range from $30 - $80. This is a wide range of small toys Nathan picked out, as well as an Etch a Sketch. Some of these toys came from kids meals and some did not. I'm not sure of the true value, but they cost two bucks total for all of them together. The Etch A Sketch alone is about $22 new. The super colorful top toy here is an infant crib and playard toy. It attaches to the crib or playard for baby's entertainment. The rest of the items are a bunch of random stuffed animals and small toys, as well as a new infant nail clipper. The crib toy was a buck fifty and the other items were two dollars all together. Comparable crib toys usually range from $15 - $50. What kid doesn't love a race car carpet or rug? We got this for three bucks! Seriously! These can start at as little as thirty bucks (depending on size and brand) and go way up from there. The one we found is an IKEA Lillabo Play Mat and is currently priced at about 62 bucks on Amazon. As you can see, our quick thrift store visits were quite productive. Most of these items were items we had planned on getting at some point, but figured we'd have to save first. We didn't go to the thrift store looking for them. We generally just go and see what we can find. Apparently, we're very good at finding exactly what we need without even trying. The Universe also seems to be looking out for our family a ton lately. I've always been a bargain hunter. But during this pregnancy with Nova Skye, I've become a master at getting baby items that are useful for FREE or very cheap. 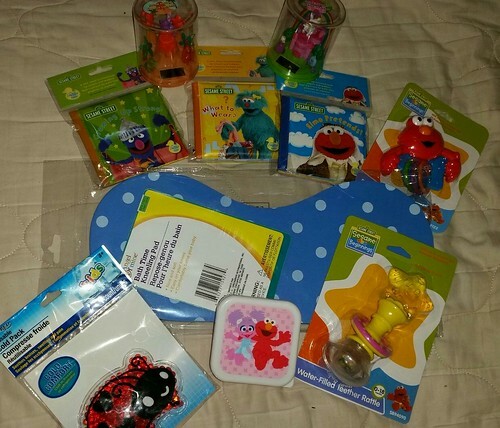 Here's a recent mini haul from our local Dollar Tree in Aurora, Colorado. This is Dollar Tree, so obviously, since there are ten items pictured here, this trip was ten bucks plus tax. Babies like to look at interesting things, especially colorful ones that move. The top two items pictured are solar powered figurines that have a moving character at the top. Obviously, a baby cannot play with these. Therefore, they should sit safely in a sunny spot (like a window sill) that your baby can see, but not reach. Next up, you'll see two brand name (Sesame Street) baby books. They are the soft squishy plastic ones that babies love to squeeze and turn the pages on. This is an excellent find, as baby board books are usually around five bucks or more each. Next to the books is a teether and rattle, again Sesame Street themed. Babies love to play with these and we needed a few more toys for Nova when we found this. Directly underneath, is a different teether and rattler that the baby can shake and chew on, also made by the Sesame Street brand. The blue thingy in the middle is a knee pad for the parents, so that no one gets sore while bending over the tub to bathe the baby. With my weird leg issues, I really needed this and at only a dollar, how could I say no? On the bottom left is a cold pack, which is very useful for those times when baby whacks herself with a toy or does something else baby-like, resulting in injury that just needs a quick cold compress. Hopefully, we won't need it, but parents can never over-prepare. This is not my first rodeo and I know the drill well. The last item in the middle at the bottom is a square-shaped container. It's supposed to be for snacks. However, since newborns don't snack and we needed a good, sanitary binky container for the diaper bag, we thought this was a good fit. By the way, in case you're wondering, anything the baby might play with, chew, eat out of, and so on was clearly marked as BPA-free, which is pretty awesome for a dollar store. *What have you discovered at the Dollar Tree (or other dollar stores) lately? Please share below! We're 37 Weeks Pregnant! Fetal Development, Huge Updates, & More! We’re 37 weeks pregnant with Nova Skye Rowell as of May 14, 2016. Keep reading for baby wellness, huge updates, 37 week fetal development, and more! What’s Nova Been Doing This Week? She’s being a cute little baby. But seriously, not much has changed. She’s extremely active, as always and growing too. Read about the doctor’s visit below to see what else is going on, so as to avoid repetitiveness. What Did the Doctor Say and When’s the Next Visit? Rich talked a little about what the doctor said in a vlog update. However, we wanted to further explain in better details what exactly everything means, since a few people had some questions after hearing that update. We were going to get an ultrasound on the 13th (yesterday). However, in order to get the best idea of what's going on for what will probably be the last ultrasound, the doctor would have ideally wanted Nova to be in the head-down position. She had been in that position for over a month. But she’s been extremely active, especially yesterday. So, she moved out of that position at some point. In addition, she was just moving way too much to get a good ultrasound. Therefore, we’re now going to get the ultrasound on the 23rd instead. As a funny sidenote, shortly after we left the doctor’s office, I felt like she moved back in the head-down position, of course. We’re hoping to keep Nova inside a little longer, just to be safe. But, she’s actually at term now, so she’d likely be fine if born today. However, a little extra time (as long as possible before the due date) is always good. At 37 weeks, she's term and 39 weeks is full term. So, we’re going to try to keep her in as long as she’ll stay put, even though Lyn’s in horrendous pain. That said, because of the immense pain Lyn’s in, the doctor did offer to induce at 39 weeks if she isn’t here by then. Normally, we would go the natural route and just let her come when she comes. However, because Lyn’s so miserable and the baby feels what she feels, we think it’s better for her and Nova both if we get induced as soon it’s safe to do so. Therefore, we accepted the doctor’s offer and if she isn’t born by May 31st, we’ll be getting induced that day. After the doctor visit, I’m feeling both annoyed and relieved. The annoyance isn’t directed at anyone, though. It’s just because I really wanted to see an ultrasound of Nova and that just couldn’t happen. Such is life. I just get annoyed easily lately, due to being in pain and being stressed about the baby for so long. However, that annoyance is small, compared to the relief that we’re at 37 weeks now. Most babies are born between 37 and 42 weeks. So, we’re finally at that point where she is highly likely to be perfectly fine, even if she’s born before the due date. I’m also very relieved to know that if she isn’t here by the 31st, we’re getting induced. It’s not that I want her to come early. Who wants that? But I do know she feels everything I feel and I’m suffering right now from the pain. I don’t want her to feel that. I only want her to feel happiness and comfort. Therefore, the soonest safe time for her to come is really the best for her. Like any mom, I simply want what’s best for my child and I feel like the longer she has to endure the emotions from the pain I feel, the worse it is for her. Babies don’t need to feel that kind of suffering. I’m still not entirely sure that anyone even fully comprehends the amount of pain I’ve had to endure for months without any painkillers at all. I have a very high tolerance of pain. So, if I’m feeling it at all, it’s bad -- and if it’s actually hurting me as bad as it is, it must be way off the charts for most people. With the other kids, I was that mom in labor who was just calmly stating to the doctors when each contraction came and when it was time to push, I just calmly pushed as hard as I could and made it happen. I don’t feel pain like other people do. Therefore, if I’m feeling it now, I’m in bad shape. I just really haven't talked about the depth of the pain much because that’s not me. However, people need to understand how bad it is to understand why I chose to accept the offer to be induced on the 31st. It is very necessary for the mental health of the baby, as well as myself - but I mostly care about it for her. She does not need to be feeling this. I’m not sure that I have much to add beyond what Lyn has already said. I will say that the sooner Nova is here with us, the better. I made a vlog earlier this week about my perspective during a rough pregnancy. Essentially, I said that it’s extremely frustrating to watch Lyn go through all this, because there is really so little that I can actually do. Feeling powerless to truly help Lyn through her pain is not fun at all. Through all this, though, I’m greatly touched by all of the things that people have done for us in preparations for Nova’s arrival. This past week, we received a couple of large Amazon gift cards with which we bought a few more remaining items from the registry. We also just received a few more clothing items in the mail from a Facebook friend this week. The generosity has been overwhelming, and I can’t thank everyone who has given us much needed items enough. Only your healthcare provider can tell you exactly what applies to your specific baby, as they each develop differently. However, the 37 week developmental info below should give you an idea of the typical things you and your baby should experience at 37 weeks gestation. Getting Closer to Baby Day! Who Has a Guess? We're 36 Weeks Pregnant! Fetal Development, Updates, Wellness, & More! We’re 36 weeks pregnant with Nova Skye Rowell as of May 7, 2016. Keep reading for baby wellness, other updates, 36 week fetal development, words from both Lyn & Rich, and more! Nova is more active than ever. It’s fun (and sometimes painful) to see and feel her movements and be able to identify certain body parts. A foot or hand here and there looks quite cool. It’s also reassuring, what with all of the risks, even when it’s painful, such as when she kicks Lyn in the ribs or something. It seems that she’s just as impatient to meet us as we are to meet her. Lyn is continuously experiencing contractions and has been for over a month, which is why she’s on medication, medically-ordered bed rest, and “no-work” orders. Please keep telling Nova to stay in there just a little bit longer. We are very impatient to meet her, but at the same time, we also want her to be okay when she comes. When’s the Next Doctor Visit? Our next scheduled visit is on Friday, May 14th at 10:45 AM Mountain Time. Then, the doctor plans to do another ultrasound and take Lyn off of the medication she’s on for slowing/halting the preterm labor contractions, as long as everything still looks good. At that point she’s term and most babies are born between 37 and 42 weeks Therefore, once we’re there, there’s not as much urgency to keep her inside. It’s fully possible she will come before then, however. The good news is if we make it to the appointment and she’s ready to give birth, the hospital is right next door to the office! In fact, it’s even connected by a bridge on that same floor! We obviously hope she stays in as long as possible. But with all the risk factors going on, 37 weeks is probably the most we can realistically hope for. Today is super special for so many reasons. Not only does Lyn get to celebrate being a mom to 4 awesome kiddos (soon to be 5), but we both get to share a birthday together with our perfect match. Yes, we were both born on May 8. Isn’t that awesome!? Today, we are not thinking of material gifts. Our best birthday present is knowing that we are going to be blessed with a miracle baby we never thought would happen. With Rich's chemo treatments and the type of cancer he had, coupled with Lyn’s health issues, Nova Skye came to us as a huge and very welcome surprise. Lyn’s been through hell and back with this pregnancy and is not feeling well at all today. However, Nova is well worth it, as is being able to give Rich his first (and probably only) child. We are under the best medical care anyone could ask for. The OB who’s treating Lyn and Nova has delivered 3 of the other kids and is extremely well-known in Colorado as one of the best. In Lyn’s opinion, he is the best in the world. We also want to say Happy Mother's Day to both of our moms, Jeanne, and Deborah. Both of them have been very supportive throughout this difficult pregnancy. Also, without them, none of us would be here and none of this would be possible. Because of them, we learned to be amazing parents. We are celebrating with Jeanne in-person as a massive birthday, Mother’s Day, and baby shower celebration and with Deb from afar, since she’s in MA and we’re in CO. Though, to us, she is here in our hearts. Also, a special shout-out to Tia and Amber, the two oldest kiddos, who are working hard to make this day awesome. Though, all four of them do amazing things daily. We love them all the time, each of them for their unique qualities and can’t wait to meet the fifth. She’s giving me a hard time today and even though we’d love to meet her, we’re hoping she’s patient enough to wait at least until 37 weeks (Saturday). This past week has been extremely stressful and exhausting -- and PAINFUL! I’ve had little sleep and lots of pain. However, as much as it would make my body feel better to have Nova come right this second, the goal is still to get to at least 37 weeks. I do so badly want to meet her, but I also want her to be as healthy as possible when she gets here. Therefore, in addition to the normal things, such as eating well and drinking lots of water, I am taking all of the doctor’s advice, as always. The side effects of the medication I’m taking are about as far from pleasant as one can get. However, none of it seems to be putting either myself or the baby in danger. Therefore, as the doctor has recommended, this is really the best course of action to keep her inside longer. We’re almost there. If I made it this far, I can make it another week. Actually, at this point, getting to 37 weeks is less than a week away: 6 days, to be exact. Nova and myself are both fighters. Regardless of when she decides to come, I have faith that she will be just perfect. But I will be focusing on resting and doing all I can to give her the best chance possible. So, if I’m less responsive to people than usual, that’s why. Nova’s health comes before everyone and everything right now. I feel extremely grateful to have the most supportive partner by my side that I could have asked for. In fact, if I had to ask before I had him, I would not have known what to ask for, nor would I have expected what I did get in Rich. Please continue to send positive vibes, light a candle, meditate, pray, or whatever you do that you think will help keep Nova inside for the perfect amount of time to be as healthy as she can be. Thank you all for your continued support. Really, all I have to say at this point is that I can’t wait for Nova to be here. It’s been quite a ride, getting all of the stuff together for Nova, making her place ready, and going to all of the pre-natal appointments. We’ve already visited the hospital a couple of times and even had an overnight stay. Throughout all of this, though, Nova herself has been fine. Her mother, not so much. Both Lyn and I have had many sleepless nights. I have to be sure to at least get a few hours in so that I can help her take care of what she can’t right now. Yeah, once Nova is here, she’ll need a lot of attention. But it’s a much different kind of attention. I know how badly she wants to meet us. My impatience is pretty maxed out already. Please, Nova, come and meet us now! Only your healthcare provider can tell you exactly what applies to your specific baby, as they each develop differently. However, the 36 week developmental info below should give you an idea of the typical things you and your baby should experience at 36 weeks gestation. We’re 35 weeks pregnant with Nova Skye Rowell as of April 30, 2016. Stay tuned for 35 week fetal development, wellness updates, and more. It’s finally time for the daddy-to-be to sound in on what’s been happening. Therefore, this post is being written almost completely by daddy, with a few words from mommy, where noted. The Momtrepreneur is handling things about as gracefully as can be expected for what’s become a difficult pregnancy. The good news is that the baby is fine and she should be here soon. Nova is kicking harder and more often than ever before. It could be taken as a sign that she’s really ready to come. The pre-term labor contractions Lyn is having are making it awfully tight in there, so it’s hard to blame her. We haven’t had an ultrasound since we went to the hospital visit at 32 weeks, so we don’t quite know how much she’s grown in the past 3 weeks. But I’m going to assume she’s rapidly growing in there. She would probably be ready to come if she were to come now. Currently, we’re scheduled for an appointment with the OB/GYN on May 6th, which is Friday. I’m not sure there will be an ultrasound done at that appointment. We’re doing everything we can to avoid the ER, since at this point, the hospital would just admit her until the baby is born. The medicine Lyn is taking is stopping labor from happening, but it’s extremely painful for her. If we can make it to May 7th, that will be 36 weeks. We’re just trying to buy every possible day we can for Nova’s well-being. How’s the Momtrepreneur and Daddy-to-Be Doing this Week? With Lyn relegated to bedrest, I’ve had to take over pretty much every household thing possible. With our car back on the road, I’m also having to drive my step-daughter to work and deal with other things as they come up. It’s very difficult juggling things because we end up with a lot of schedule conflicts that I somehow have to work out. In a word, it’s stressful. I’m also actively looking for work to supplement our income. While I have a promising lead, nothing is guaranteed. The good news is that it’s a work-at-home position, so while I have to be stuck in front of the computer for hours at a time, I’m still physically here to help out whenever possible. It also saves a lot on gas and time spent commuting. Really, it will make everything easier to have Nova here as soon as possible. While that seems counter-intuitive, it means that Lyn can finally recover, and we’ll have something happy to celebrate. Honestly, the big achievement is keeping Nova in there yet another seven days. All of the major items are already bought, paid for, and here. So we didn’t acquire any items this week, but there’s really only minor things left on the Amazon Baby Registry. At this point, it’s just making sure that everything is ready for her if she came tomorrow. The car seat and diaper bag are already in the car for us to go at a moment’s notice. There isn’t really much left to do but have her and bring her home. Again, we are so blessed with the generosity of family and friends that helped to acquire some free items, as well as purchasing some of the bigger items off of our list. Listia was also a major help. Lyn making her own cloth diapers has also alleviated a lot of that cost, and we have plenty between those and other ones we previously purchased. We’re actually in really good shape. Here’s how to get most or all of your baby items for free. I haven’t been feeling great at all this week. That , coupled with the fact that he hasn’t gotten to say much, is why the upper part of this week’s post was written by Rich. As he mentioned, the main thing right now is to try to get Nova to stay in as long as she can to avoid issues. At the same time, it will definitely be a relief once she’s finally here. The OB said it would be ideal to get to 37 weeks (that’s considered full term at that point), so that’s the goal. However, I’m not going to freak out if she comes before then, as she has a really good survival rate at this point, going by statistics. I’m not going to purposefully do anything to make it happen, as I believe in letting nature do what it does best and only intervening when medically necessary. The doctors are the only ones qualified to make that decision. However, I’m going to stop letting myself freak out about whether she’s going to be okay or not. I’ve been stressing about it, ever since before the preterm labor scare, since I’ve been doing so terribly during this pregnancy. None of the ultrasounds have shown anything but extremely good news. Therefore, I’m confident that’s what we’ll have when she decides to come out. I need to trust that she will come when she is meant to and she will be just fine. I highly doubt all of this came together so perfectly for something to go wrong. I’m a little scared because she was so small at 32 weeks. But as active as she is and as good as her ultrasounds have all looked, coupled with the fact that the medicine is keeping her inside for now, I have to trust that nature and modern medicine have her covered. I also should take comfort in my own mothering skills, knowing that I’m eating healthy, resting, following all doctor’s orders, and doing everything in my power to make sure she is healthy and staying put as long as possible. I haven’t gotten very personal in many of the posts, as I want to focus mainly on the positive things. I am a firm believer that the energy that’s put out there is exactly what will be received. Therefore, even though I do feel extremely horrible, I have nothing but positive thoughts on Nova’s eventual outcome. She has been very active this whole time and I feel her energy, of course, making me believe she will be just fine. Of course I get scared. But overall, I have to believe that everything will turn out just fine. Here’s to hoping I can make it through this pain and other billion symptoms for at least two more weeks, to give her the best possible chance. It was all I could do to write the snippet I wrote above. I love doing the summaries of the fetal development. But I’m just not up to it and have to think about the baby. Therefore, like the last post, I’ll leave you with links to some great info. I'll be straight up honest with you. I'm not handling this pregnancy as gracefully as I would like to. While Lyn and I don't argue, we have had a lot of stressful situations lately. Because she's been on bed rest, a lot has fallen on my shoulders. Also, I'm becoming extremely impatient, because I really just want to meet my daughter, dammit! On the flip side, Lyn is handling what's been a very rough pregnancy about as gracefully as humanly possible. She still wants to do everything and I have to constantly stop her and just do things. She's still beautiful and wonderful just like the day I met her. We really just need to have Nova here, on the outside, so Lyn can really return to being herself. It's been very painful for most of the pregnancy, but after the 32-week preterm labor scare, it's only gotten worse each day. The stress that it's putting on me has almost broken me on some days. Guys, those who have been through this late part of the pregnancy, I salute you. But Lyn has been about as good as she can possibly be. Part of it is that she's already had four. But this one is different. She went 11 years between pregnancies. I just want her to feel good again. She's still so beautiful, but I want her to actually feel like that again. We're just human and of course, we'll have bad days. But if we're miserable, so is Nova. So please keep us in your thoughts and prayers these next couple of weeks. We really are just aiming for 37 weeks. We just have to survive until then. I'm going to make it a point to write more updates going forward, as Nova deserves it. Lyn Lomasi & Richard Rowell are enjoying raising Nova Skye, born in June of 2016. Nova means "chases butterflies" in Cherokee and they hope she always flies high in the sky chasing after her dreams and goals. Join them on their journeys through baby & toddler parenting fun, see life through the eyes of Nova Skye, and so much more!